Kanger SUBOX MINI Review – It’s Simple! 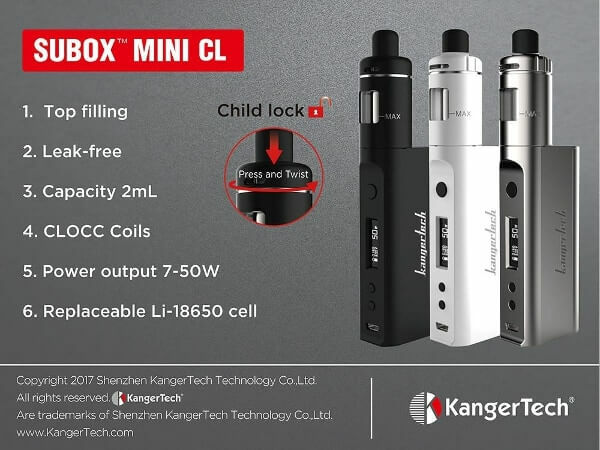 The Kanger Subox Mini was the best box mod UK for sub ohm vaping and has now been upgraded to include a child lock and TPD compliance. 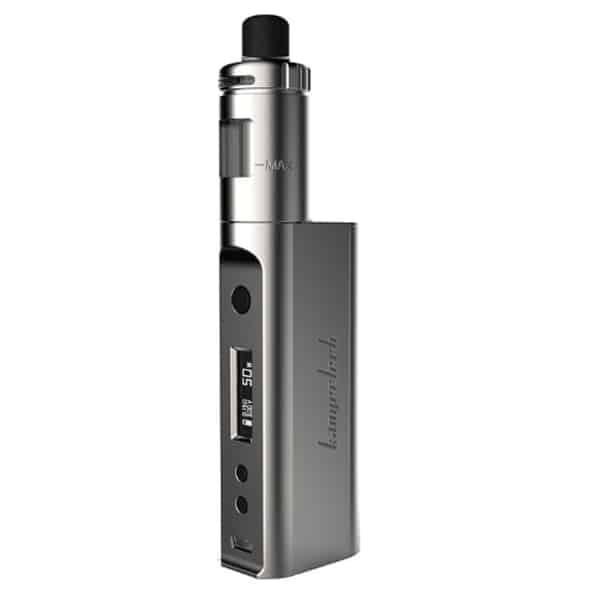 The new upgraded UK Kangertech Subox Mini is the upgraded Kanger KBOX version allowing power control and top-fill versatility from a solid 50 Watt output. The Kangertech Subox Mini vape mod takes all the best ideas from the “cloud chaser” and sub ohm mod range of box mods and simplifies. It is also a very cool looking box mod device. Here you get a hybrid regulated device capable of exceptional vapour production offering both pre-built and DIY RBA options (sold separately). 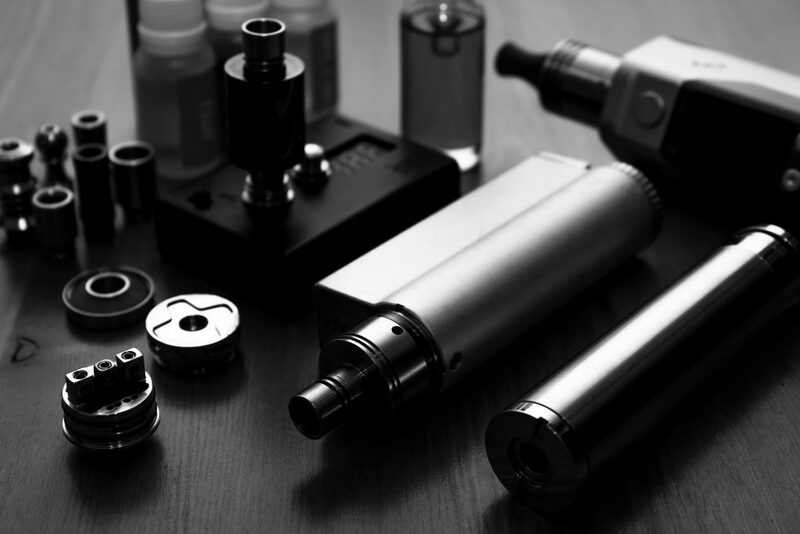 In addition by offering atomizers of difference resistance you can use the device as a sub-ohm mod device or simply as an e cigarette or vape pen. However for vapers who need 200 Watts plus (mmm!!) then the mod of choice has to be the Smok Alien which offers 220 Watts but the Alien does need advanced knowledge of sub ohm vaping! Vape Pen or Vape mod + Sub Ohm Vaping? As an e cig or vape pen though, if you don’t need sub ohm with the massive clouds but do want to migrate away from smoking there are better choices, simpler, smaller and more convenient devices that will deliver your required nicotine. With the Kbox mod though you can decide to use it like a vape pen by using the higher resistance coil i.e. not the sub ohm coil, but is is a bit cumbersome in comparison to the smaller high quality vape pens you can buy. With the Kanger Subox you can also decide on which route is best suited to your needs – pre-built or DIY coil. 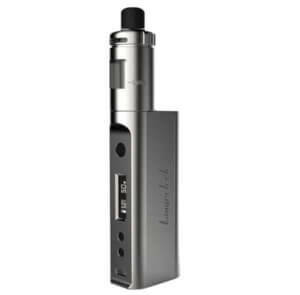 It comes with the Kanger CL TopTank and if you like the DIY approach a build-able coil kit is available. At any time you can also switch between sub ohm vaping (where the vaper inhales directly from the device into the lungs) and normal vaping (vapour to mouth and then to lungs as in traditional smoking or using an e cig) should you wish to by using the correct resistance coil. But standard vaping with such a device, as stated above, seems to defeat the object of having a sub ohm device – far better to have a quality vape pen imo. In addition the Kanger Subox Mini vape mod offers an excellent range of power options to fully experience sub ohm vaping, “sub-ohming”, as a style of vaping. See our advantages and disadvantages of sub ohm vaping, what are the risk and dangers? You can use Kanger’s own optimised tank system – the KangerTech CL TOPTANK with various coils and wicks etc. or should you wish to experiment with other manufacturers sub-tank set-ups the Kanger box mod is compatible with industry standards. However if you want the best, Kanger Subox Mini offers everything you need and more. I would point out that I cannot see a compelling reason why one would want to experiment if the box kit itself does everything you wanted it to … and more. However the option is there if required. Simple options like these make the Kanger the best box mod for sub ohm vaping. The Kanger Subox Mini is a relatively inexpensive regulated vaping mod, not a cheap box mod but you get what you pay for, and offers significant user options and safety options that can involve the relatively complex to the very straight forward methods of vaping depending on the user’s desire. The full specifications and safety features are given below at the end of the review. The build quality is very good and this is also a solid vaping mod device. At under £40 it is a steal! This box mod puts out a decent 7-50 Watts and is capable of handling resistances as low as 0.3 ohm. Wattage is variable between in 0.1 ohm increments. The Subox Mini mod kit contains pre-assembled CLOCC stainless steel coils including two 0.5 Ohm coils. In addition a separate accessory kit offers an improved RBA for higher wattage use, the best in sub ohm vaping for the avid cloud chaser! All the required parts are included in the kit including wick, coils, tiny screws and a compatible screw driver for those who like DIY too! This compact small box mod device, just over 3 inches long (ex-tank) feels neat in the hand and with its various coil options and variable airflow supports the needs of most vapers from the experienced to the new. However for the majority of smokers looking to transition to vaping the straight forward much smaller e cig will be the better option – see the review section of the site. For those wanting huge clouds this is the vape mod to get. Simply switch the KBOX on or off with 5 clicks of the user switch. Alter the wattage up or down using the additional smaller + and – buttons. When starting out you will need to find the optimum power for your particular e liquid & mod combination, i.e. taste and vapour production. This is relatively straight forward and is done by adjusting power from a low wattage to a higher wattage (higher temperature) in small increments. At some power level the vapour will feel slightly warm as you inhale and this gives a clue that you are near optimisation – you then need to tweak the power up and down around 1 -2 watts (calibrated in 0.1 watt intervals) where you should find a comfortable vape that produces the required taste and vapour levels from the mod. This level will be variable depending on you, the coil you are using and the e liquid in the tank. A PG e liquid will require a different setting to a VG e liquid. Avoid the temptation to use high settings, around 20-45 watts will suit most sub ohm set-ups. Kanger include a handy crib sheet with some recommended power levels for each coil resistance and a combination of e liquid mixes for their box mod which does make the whole thing easier than you think. You do need to remember to prime your new coil by dripping a little e liquid onto it prior using and leaving it to absorb the e liquid for 5 minutes. The output LED Screen is small, not the absolute best but easily readable with details of battery life remaining, current resistance of coil and power/watt output. Always check to ensure you are using the correct power setting when switching between coils. The box mod unit is easily charged using mini port and USB. 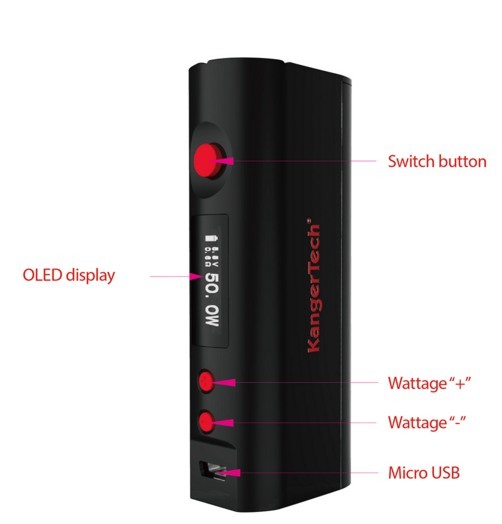 Ideally you need to buy 2 compatible KangerTech batteries and a battery charger is very handy, charge the spare whilst you are using one ensures you never get stuck! The battery fits at the rear of the mod device, it is housed in a neat magnetic lock snap on lid. There is also included in the kit a red sticker – this is because the battery lid cover has vents – by covering the battery with the red sticker ensures that the colour co-ordination of the device is maintained – a nice touch that would have easily gone amiss. Kanger have literally thought of everything? 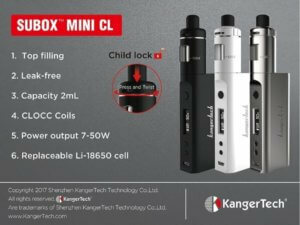 The Kanger Subox Mini instruction manual is very detailed and gives full explanation of all the Kbox settings. There are 3 setting buttons, one of which doubles up as the on/off switch and the activation button for vaping. The other two vary the wattage, the “+” increases power and the “-” decreases power, the output wattage is shown on the OLED screen. The only other setting is the adjustable airflow which varies the air that is inhaled with the vapour as you inhale. This can be used to restrict the air flow, eg when you are using a higher resistance coil for standard vaping or increase airflow for maximum “cloud” output when used with the sub ohm coils. Different e liquids behave differently at different power settings so you need to alter the power to suit your specific e liquid. Start low and increase the setting until you reach what you feel is optimum. The Kanger Subox kit also includes a crib sheet that gives user settings for various PG/VG e liquid mixes which is helpful. Kanger have manufactured a top-quality vaping mod device that allows both new and experienced vapers to enjoy big cloud vaping but the big difference is that they have given you straight forward options. For a few pounds more get the SUBOX Platinum for a very cool look (no longer available). For those simply wishing to migrate away from smoking to vaping there are better, smaller and simpler options though. The options with the Kanger KBOX mod box will allow the user to get involved with vaping at any level but with a large scale device that may not suit everyone. If you want a larger scale device that blows plumes of vapour though, once you know what you like, Kanger have accessories that will suit your vaping style. You can at any time choose a different vaping style too – extreme or regular! There are some good devices out there and some great devices out there and for simplicity and freedom this is the best mod UK! 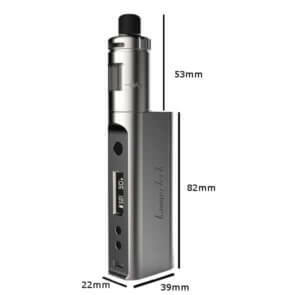 If you want a complete sub ohm mod kit including Kanger Subox full kit plus top quality Samsung battery and battery charger and VSAVI ECO-vape cloud e liquid, save over £20. Pure eLiquids offers a heavily discounted best cloud chaser Kanger kit here. Battery Polarity warning – if you get it wrong way round! For a straight forward high quality Box Mod Kanger’s SUBOX Mini will take some beating. With it’s simplicity and additional flexibility options for those who like building their own and for those that don’t or for those that just want the choice this is an ideal vape mod for both sub ohm and none sub ohm vaping. None really. BUT if you just want a simple device to quit smoking then there are simpler smaller e-cigarettes Here that would suit you better. A known and respected manufacturer of quality e cigarette devices & mods as reviewed by the best vape review sites. 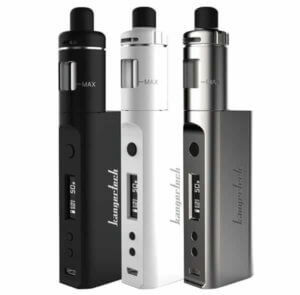 Established as one of the best box mod devices in its class at reasonable cost. 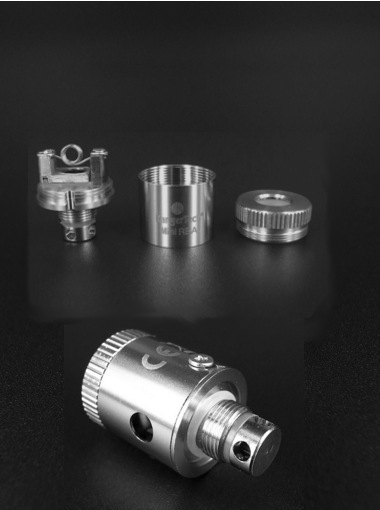 A mod device that offers vapers the opportunity to delve into building their device if they want to. A box mod device that offers vapers pre-built options should the user NOT want to get involved with the nitty-gritty of building their own atomizer BUT does want to get involved with sub-ohm vaping. I’m relatively new to vaping but I’ve not had any issues with these coils. I picked them up to go with my Kanger-Subvod (my wife has one too) and neither of us have had any issues to speak of. No dry hits, no leaking, and we each have gotten about two weeks per coil. I also got a pack of Clapton coils, and the SSOCC work much, much better. Ok, I’m a heavy user (sometimes a “chain vaper”) and here’s my review. I’m top filling and now I’ve realised to close the airflow when filling, I’m not getting any leaks. Haven’t fiddled with the coil at all, simply primed it before first use. Using Kanger SUBVOD, and vapemate menthol special blend, 1.5mg strength, and 70% vg blend. As a sidenote, all other devices I’ve tried before now have not fared well with menthol liquid. All have burnt out quicker than expected (some only lasted a couple of days e.g. C3 coil from totally wicked). So far, I’m really happy with the quality of this coil, and delighted with how long it is lasting. Please note that these coils have more cotton than the square ones so you need to prep the coil accordingly. For those of you who are having leaks, please make sure that you are not overfilLing your tank as this is the only time this has happened for me. I get about 2 weeks out of these coils as long as I do not switch juices. Switching juices tends to shorten the life of my coils and typically leads to a cotton implosion. All of that being said, I still like the clapton version of this setup more. Square OCC how I wish you were here! Every single one I have tried has leaked profusely as well as my wife’s. I have resorted to rebuilding our old square occ coils. We both run tops with a mini and a nano, I do hope you listen to your loyal customers and redesign these or bring the square back. I would hate to quit doing business over a $4 coil! these Kanger coils are sensitive to which liquid you use, however, if you use a liquid with a higher pg than vg (i use ripe vapes act) these work no problem. High vg juice doesn’t like to flow in these as there are small holes to wick. PRESOAK your coils, put drops on all of the wick holes, and a few inside, fill your tank3/4 of the way and before you close the cap all the way open up the air holes then finish screwing the cap, seems to relieve pressure and let the tank atmosphere equalize faster. wait 10 mins before hitting it and you should get at least 3 or 4 days of heavy use before its cooked. You guys sound like newbs, don’t go over 30-35 watts on these o.50 ohm coils. Also remember to prime them first! Drip some juice into the holes before screwing it into the tank. These coils work great if you treat them right. At 25 watts and with premium juice the coil will last up to two weeks easy. Just don’t crank your watts up and try to vape at 45 watts like a dummy. They push clouds trust me. And they are durable. I love my kbox nano. Plus the coils are only like 4 dollars a piece. Just treat them correctly. My local b&m doesn’t carry the square OCC coils I loved so much. Gave me a pack of the new SSOCC 0.5 and was assured it would be just as good if not better. Had a bit of trouble getting the cotton on the sides to prime, so poked a few holes with a thin needle and really let it soak. First thing I noticed was a huge lack of vapour with my normal juices/wattages. Now after 24hr I’m unable to go over 25W without getting a burnt taste on 60/40 juice. Not sure what I’m doing wrong if anything but these don’t live up to the OCC coils that worked so well. I had to poke a few holes on the organic cotton with a sewing needle so it would wick properly, I was geting no flavour and burn hits using 50/50 and 70/30 VG PG E Liquid. After doing it, this coils are way better than the previous replacement coils, amazing flavor and vapor production. I’m rating only 4 stars because for inexperienced users who don’t know/do this “trick” while using high VG E Liquids will most likely get no flavour, poor vapor production and dry hits. I have had a nebox for about 7 months;. For my nebox I have used all the different. 5 ohm coils. have not had any problems with them. probably have went through 25 coils total;but no problems. an occasional dry hit”-and I don’t wait long enough after priming. these coils have been good. I bought these new coils in the 1.2ohms and they seem to be ok for the first couple of vapes then they start to gurgle. I have it set at 16.5 watts, which is where i had the square ones set out with no problems, but with the new SSOCC coils they gurgle. Have i got this setting to low. I am vaping a 50/50 blend. love these coils.i was happy to see Kanger make ss coils and the claptons also because i use my subtank minis more than any of my other tanks and these give better flavor and a more clean taste.i also have noticed they last longer than the regular coils to.i have read other people complaining about these coils leaking in the nebox and it is not because of the coils, a coil can not leak lol only a tank and it is due to people not using the nebox correctly and it is something i have also seen people doing by filling it wrong or not screwing the coil down properly.i do not own a nebox but i have a few friends that own them and have seen the mistakes first hand. I have used all versions of the Kanger OCC coil. Second one, the vertical square seems the best to me. The ssocc leaks. It leaks in my husband’s NEBox, and in my subtank mini. i’ve been vaping for several years, and, I’m a techno/DIY/research king of geek, always built my own everything. That being said, I’m no noob, nor do I have problems understanding how things work, as it seem a lot of people do. That said, These new SSOCC coils are just amazing! I usually build my own coils, but I do have a Subtank Plus, and two Subtank Mini’s. I stated using them with the first version of Subtank coils, and had some problems with dry hits, then, when I tried the verticals, I was very impressed with the improvement, (not a flood or dry hit since). One of the guys at my B&M, gave me a Kanger SSOCC coil to try out, and I am blown away by both the flavor, and the vapor. These are as close to a good RBA, as it gets. I have absolutely *no* leaking, and *no* gurgling, unless I’m sloppy with my refilling, and a tightly twisted paper towel cleans that out right quick. I know that it is Kanthal in the coil, but then I did the research, before I started using it. And yes, I think that it should state, clearly, on the package, that it is Kanthal being used in these coils, it is quite misleading. If your supplier told you that these had stainless wire, they *they* didn’t do their research, and shame on them! I love them, and I will continue to recommend and use them myself. Thank You Kanger, for another great product.